Tomorrow is the official first day of spring, which means it is also Wattle Day. The Golden Wattle (Acacia pycnantha) is Australia’s official national flower, proclaimed as our floral emblem on September 1 1988, and marked by planting a Golden Wattle in the National Botanic Gardens by then Prime Minister’s wife, Hazel Hawke. Four years later, September 1 was officially declared National Wattle Day, and it is traditional to celebrate by wearing a sprig of wattle (any type of wattle; it doesn’t have to be Golden Wattle). Long before that date, wattle had been an unofficial national flower by popular choice. A wreath or sprig of wattle appears on many official government documents, including the Commonwealth Coat of Arms, the Order of Australia, and the Governor-General’s crest. Our national colours of green and gold (so difficult to co-ordinate on sporting uniforms) are inspired by the green leaves and golden bloom of the wattle. Wattle is a symbol of remembrance for us too. During World War I, mothers sent their sons sprigs of wattle as a reminder of all they were fighting for back home, and has been used to mourn and remember loss of Australian life, such as in ceremonies for the victims of the Bali bombings. You may have noticed that when the first victims of MH17 were brought to the Netherlands, the Australian Governor-General’s wife wore a sprig of wattle. As early as 1838, Tasmania encouraged wearing Silver Wattle (Acacia dealbata) sprigs to celebrate the discovery of its island. In the nationalistic fervour which preceded Federation, a Wattle Club was founded by naturalist Archibald Campbell, promoting a Wattle Day demonstration each September 1. Outings into the bush to revel in the glories of an Australian spring were part of his plan, and patriotic Wattle Days continued to be celebrated until World War II. Australian love of wattle has been satirised in Monty Python’s Flying Circus, with the immortal lines of the Australian philosopher Bruce: “This here’s the Wattle, the emblem of our land. You can stick it in a bottle, you can hold it in your hand.” These words have been used to promote a Wattle Day Festival in Victoria this year! Acacia is the genus which contains wattle trees and shrubs. Its name, pronounced uh-KAY-shuh, comes from the Greek akis, “thorn”, because most acacia species outside Australia are thorny, although nearly all Australian acacias don’t have thorns. There are around 1300 species of acacia, and almost a thousand of them are native to Australia, with over 98% of these unique to Australia. The others can be found in all continents except Europe and Antarctica; they are particularly widespread in Africa, and were first observed by Europeans along the Nile River. Acacia is not just an important symbol to Australia. According to Easton’s Bible Dictionary, acacia may have been the “burning bush” Moses encountered in the wilderness, and a table of acacia wood was part of the Tabernacle he built for the Ark of the Covenant. In Egyptian mythology, acacia is the Tree of Life, and in Christian tradition, the crown of thorns worn by Jesus Christ were made from acacia. Freemasonry uses acacia as a symbol of resurrection and immortality, while in Asia, acacia incense is believed to drive away ghosts and demons. It’s powerful stuff. In fact, it is said that the first plant to bloom in Hiroshima after its bombing in 1945 was a wattle tree. Resurrection indeed! Every Wattle Day, Hiroshima’s Acacia Appreciation Society sends hundreds of yellow ribbons to the Australian National Botanic Gardens as a gesture of friendship and appreciation. The name wattle comes from Old English, the word Anglo-Saxons gave to interlaced branches and twigs used to form fences, walls, and roofs. Wattle and daub is a construction technique, used since prehistoric times, for filling the spaces between the wattle with a combination of wet soil, clay, sand, animal dung, and straw, which is then allowed to dry until it hardens. When British settlers to Sydney made their own wattle and daub buildings, they used acacia trees as the wattle, so gave the name to the plants. (I remember reading about wattle and daub houses in Neolithic Britain when I was in primary school history class, and wondering where they got the wattle trees from!). The uses of acacia are too many to list, but one worth mentioning is that Australian Aborigines often make boomerangs from its wood. Wattles grow all over Australia, and are numerous in the desert, although uncommon in dense rainforest and alpine regions. In southern Australia, wattles tend to flower in springtime, while in the north, many species come into bloom in the autumn and winter. Because of this, it is said that on any given day in Australia, there will be a wattle blossoming somewhere. Acacia has a long history as a personal name, for it is the feminine form of the Greek name Acacius. This comes from a different Greek derivation – akakia, meaning “without guile, innocent”. Byzantine emperors held a purple silk roll filled with dust called the akakia: it symbolised human mortality. There are several saints named Acacius, and quite a number of other notables from the early Christian era. Acacia has been a particular favourite amongst Spanish-speaking people, who bestowed it as a saint’s name. Acacia came into use as an English name in the 19th century, when flower and plant names were the fashion. Golden and Silver Wattle was introduced to Europe in the mid-19th century; Silver Wattle became a great favourite in the south of France, where it blooms around Candlemas and is a harbinger of spring and golden sunshine. Outside Australia, wattle is often known as mimosa. 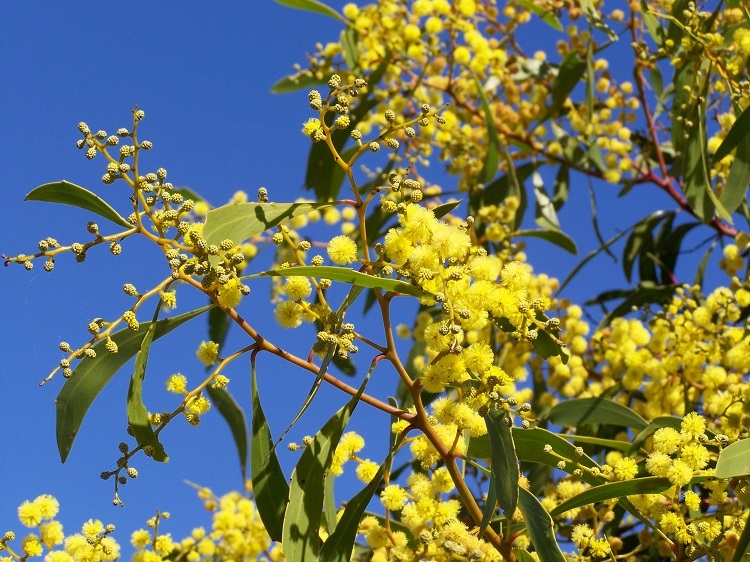 There are several people named Acacia in Australian records, going back to the mid-19th century, and it is almost certain their names were given patriotically – one is even named Acacia Golden, as if to signify Golden Wattle. Another is named Marginata Acacia; marginata is a species of eucalyptus tree. That reminds me that I saw a woman named Acacia Silver on the news, which reminded me of Silver Wattle: as she was an environmentalist, her name was so appropriate that I wondered if she’d chosen it herself. In Australia, the name Acacia is around the 300-400s, while in England/Wales it is #1639 (18 babies last year), and in the US, 80 baby girls were named Acacia, the same number as ones called Adah, Jazlene, Legacy, Saoirse, Story, and Zarah. While Acacia isn’t a bizarre name in other English-speaking countries, it’s definitely far better known and higher-charting in Australia, which makes perfect sense. As with the trees, Acacia isn’t uniquely Australian, but is more widely found here, and has a particular meaning to us. Wattles are perhaps not the most beautiful of trees – rather than being slender and elegant, or solid and imposing, most of them are short and scrubby. And yet when they come into bloom, there is no more cheering sight on a grey late winter’s day than their riotous mass of bright yellow fuzzy blossom. I cannot help but smile when I see a wattle tree in full fragrant bloom abuzz with bees, a promise of the sunshine that is soon to come. That’s why I have Golden Wattle as my avatar, and Silver Wattle decorating my blog: to keep me smiling every day. Familiar without being common, the name Acacia has a rich and interesting history, and is a very patriotic choice. It evokes the beauty of spring and the Australian bush, it’s a remembrance for those we mourn, and rises from the ashes of death with new life and hope. Pretty and floral, bright and burning, silver and golden – could this sunshiney name hit your personal sweet spot? Acacia received an excellent approval rating of 84%. 34% of people loved the name Acacia, and 30% liked it. Only 2% of people hated the name. I haven’t met anyone with this spelling yet but I know a girl called Akasha Jasmine (same pronunciation as Acacia). I know an Akayasha and an Acacia-Violet – which makes you wonder if it’s slightly more popular than it appears, due to variant spellings and double names.